Hello ... Hello ... my old friends ... It's great to see you once again! 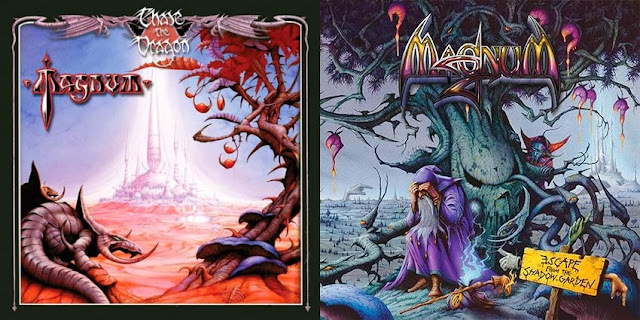 With an album cover reminiscent of their classic 1982 LP, "Chase The Dragon", Midlands rockers Magnum have just announced the release of their nineteenth [19th] album, entitled "Escape From The Shadow Garden" and is released in the UK on Monday 24th March on the German label SPV/Steamhammer. Magnum, who once featured Dave Scott-Morgan in their ranks, have had many ELO connections throughout their career. Whether it be sharing labels with both ELO [Jet] and ELO Part II [SPV] or keyboardist Mark Stanway working with Phil Bates [Wheels Of Fire] and Carl Wayne, both bands have earned the respect of and continue to retain a significant fan base. Yours Truly KJS also interviewed Mark Stanway back in early January 2011 in advance of their album "The Visitation" and you can read that interview here. ELO Beatles Forever [ELOBF] recommends Magnum to those enlightened folks who enjoy the music of ELO, Jeff Lynne, The Move, Roy Wood, The Idle Race, 'Brum Beat', The Beatles and related artistes.